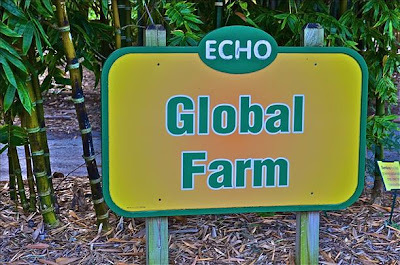 Yesterday, I took an amazing tour of ECHO'S Global Village Farm, located in N. Fort Myers, Florida. ECHO, or Educational Concerns for Hunger Organization, is committed to fighting world hunger through innovative options, agricultural training, and networking with community leaders and missionaries in developing countries. The demonstration farm teaches non-governmental workers, missionaries, and food growers hands-on, affordable, and sustainable farming techniques that can then later be applied in developing countries. The tour gives you a small glimpse of the many challenges families face growing food in extreme and harsh conditions due to terrain, climate, and economic circumstances. The farm, divided into six areas including tropical monsoon climates, semi-arid tropics, tropical highlands, tropical rainforest, hot humid lowlands, and urban gardens, is managed by an agricultural intern who spends one year cultivating, harvesting, and researching numerous crops. The seeds from these plots are then packaged and shipped overseas as potential new food crop. Considered The Miracle Tree, the Moringa is a wonder plant that not only thrives in extreme conditions but is also highly nutritious, and one crushed seed can purify two liters of water, killing 95% of the bacteria it. ECHO experiments with and creates models for Appropriate Technology, which refers to simple technologies made from local or recycled materials that are appropriate to the technical skills and income level of a given community. These innovations can not only improve living conditions but also generate much needed income. Some examples includes biogas, the process of turning cow manure into gas for cooking or lights, water pumps and purifiers, improved cook stoves and ovens, and solar food dryers. Man-made fish and duck ponds provide families with food source. Ducks on the farm release solid wastes into the pond through the slats of their coop, stimulating the growth of algae, which in turn provides food for the Tilapia fish. ECHO teaches how the integration of animals into farming activities is beneficial in multiple ways. 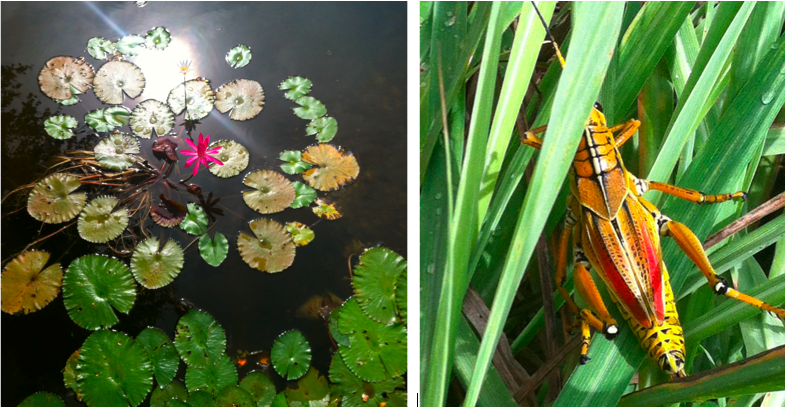 Even though the farm is meant to be purely utilitarian, you can't help but admire all the beauty around you.